Can someone please come over and clean my apartment? After camping all weekend and lazily unloading the car, here are a few things I have zero interest in doing today – unpacking, laundry (SO. MUCH. LAUNDRY. ), organizing, cleaning, cooking. We just had a long, glorious Labor Day Weekend. How can I be expected to return to real life? We’re keeping today’s recipe low-key because I’m a huge fan of easy (especially today) and I’m a huge fan of wraps (especially every day). I used to make wraps in a simple sort of way. Start with the protein, then add cheese, then toppings, then sauce. That is not the best method – not by a long shot. 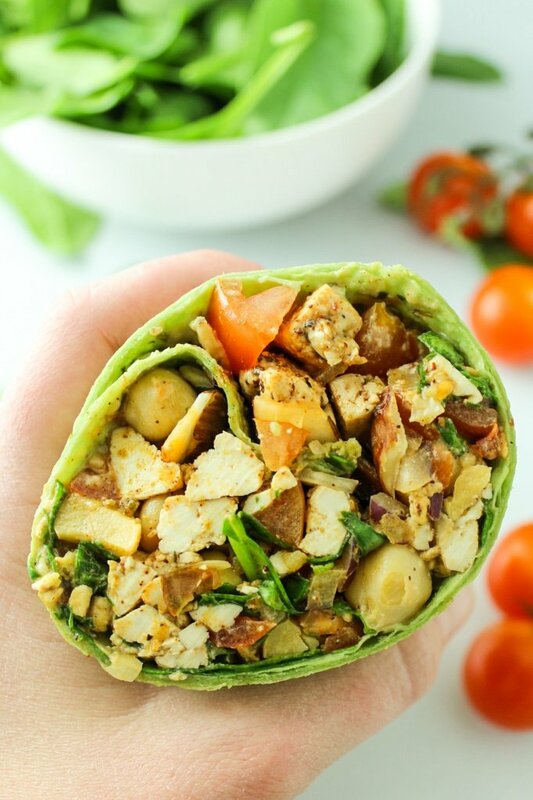 Side note – the mixture that goes into these wraps is also very good on its own. It’s like a big salad with all of the best things! Aaaaand it stays good in the fridge for 2-3 days, so you can fill many wraps with it. 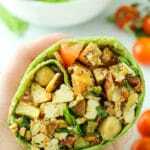 Loaded with tofu, chickpeas, greens, and tomatoes, these wraps are a healthy and filling lunch option. Drain the tofu and press to remove excess water. Chop into small cubes, about 1/2″ by 1/2″. In a skillet, heat 2 tablespoons of oil to medium. Add tofu. Season with salt, pepper, chili powder, chipotle, and cayenne. Toss to coat. Continue cooking for 12-15 minutes. Remove from heat and allow to cool. 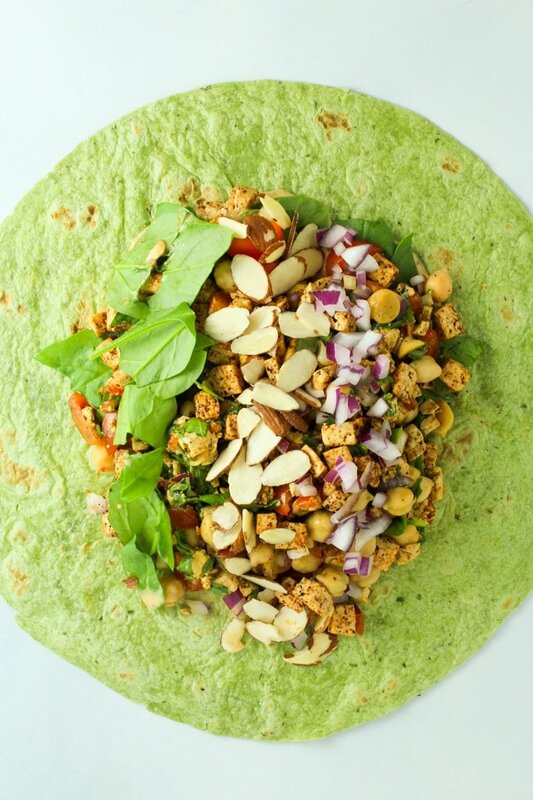 On a large cutting board, combine all of the ingredients – onion, almonds, tomatoes, chickpeas, and spinach and roughly chop until everything is combined. Lay down the tortilla and scoop the filling into the middle. Pour desired amount of dressing. Fold up the edges and quickly roll! Cut the wrap in half (or don’t!) and enjoy. *We love the vegan option that Simple Truth makes! You could definitely swap green goddess out for balsamic, Italian, Caesar, or any dressing you prefer. 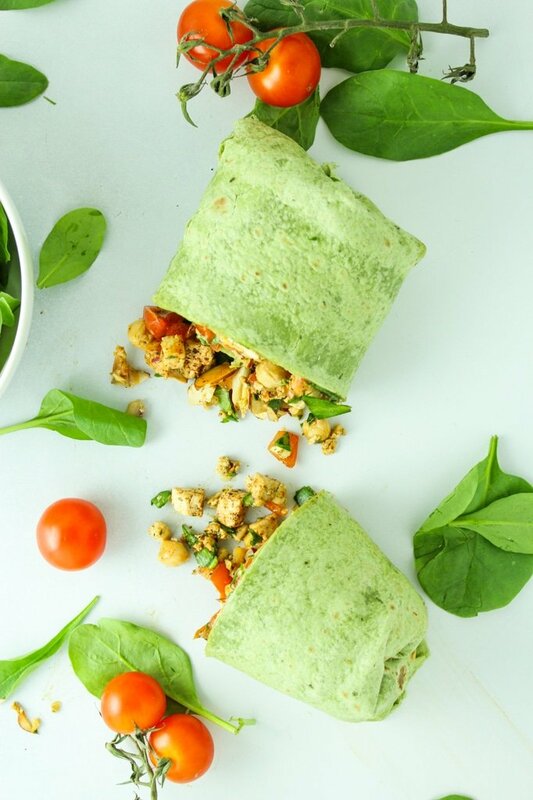 Recipe looks great, but I wonder do you have a recipe for the green wraps themselves? I don’t have a recipe for the wraps! They are store-bought from our local supermarket. Any type of tortilla should work just fine! 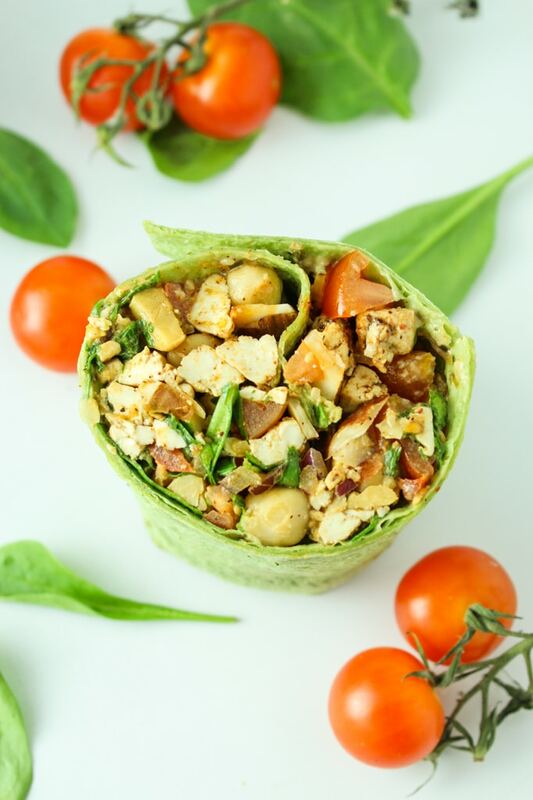 These wraps look fantastic, so colourful and appealing! i have had a bit of tofu in the fridge for a while and have been looking for something exciting to make. I think I´ve found it!